While at the CAS conference at the end of May, Heather Coleman, expert on the late-Imperial Orthodox Church, pushed me to look more carefully at the role of the Orthodox Church in education in Siberia specifically, since the zemstva (elected local governments that had been established during the Great Reforms), in charge of much of the schooling in European Russia, did not exist in Siberia. Thus, education in Siberia was the responsibility of the church, and those who went to parish schools or who attended the church-teachers’ schools, may not themselves have been religious at all. This lack of religiosity, of course, would have made Ignatii Dvernitskii’s extreme reforms at the school in 1908-09 even more likely to be rejected by many of the pupils, as they may not have been strong believers. suggesting that English-language scholarship on these types of schools is quite rare. In any case, time to investigate, and if anyone reading this had helpful suggestions, please comment or get in touch! 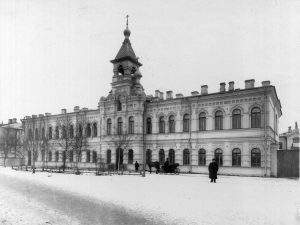 I’ve included one photograph of the St. Petersburg school (Свято-Владимирская женская церковно-учительская школа (Забалканский пр., 96)), as they do not appear to be copy-protected. Quite impressive!